Thanks for your interest in our Permaculture Design Course. Terra Perma has been having a little down time as we have recently moved to Pemberton to work on our family farm and have devoted 2018 to triaging the farm and setting up our new life down there. As we're just starting to get our heads above water, and missing teaching very much, we've penciled in a PDC in Pemberton from Monday October 21st to Friday November 1st 2019. Much of the below description will apply and the two weeks will be all you've come to expect from the Terra Perma Team. There is so much to offer in this beautiful corner of the South West, when it comes to site visits, hands on activities and our usual practical, engaging, logical, respectful and highly organised learning environments. So, although we're not yet in a position to provide all the details, we're asking for expressions on interest from those keen to join us in what will be a "petite class size" PDC for our first, exciting rural based adventure. Those who express interest will not only let us know if there is an appetite for a course in this region, but also will be given first opportunity for a place on our PDC. Please note that although the location is rural, the content will cover all PDC requirements which addresses urban, small scale and broad scale applications with the weighting of time / practical activities adjusted to meet the needs and interests of the group. It will therefore be relevant to all design contexts. If you are interested in attending, please complete the "Expression of Interest" form via this LINK. 1) The Fair Harvest full time PDC in January 2019 held in Margaret River. 2) Perth's Permaculture Educators Alliance are running several full and part time PDCs across 2019 starting in February 2019. 3) Swamp Road Farm will host a part time PDC in April 2019 in Benger. As PDC's come up within the Perth and south west WA regions, they should be added to the information issued by PermacultureWest's, so we'd recommend you kept an eye on either their Facebook page or check with the providers who are all listed here on the PermacultureWest website. Please get in touch with us via our "Contact Us" form if you have any further queries. Terra Perma Design educators Charles and Jolene, with the help of guest educators, run a full time Permaculture Design Course (72hr, 2 week course + recap / design presentation day). Take control of your future and be the change you want to see in the world. Permaculture thinking and design creates a harmony of human and nature's needs while creating richly productive systems. Permaculture's founder Bill Mollison maintains, "The problems of the world are becoming increasingly complex but the answers remain embarrassingly simple." With two presenters facilitating all lessons and activities, we can effectively address all the needs of the group and provide a very diverse experience base from which to educate. Having more than one presenter also offers more opportunities to gel with a teacher and more opportunities to chat in break times rather than waiting for time with one teacher. Additional presenters will depend on course numbers and the topic specific guest presenter availability. We pride ourselves on creating a practical, engaging, logical, respectful and organised learning environment. You'll find it quite a technical course and, whilst we do lots of walking discussions, activities and visits to design/ example sites, there will be significant classroom based learning. As long as this suits your learning style, then you are guaranteed of receiving way too much information rather than being left wanting more. You are encouraged to ask any questions at any time throughout the course - your questions will be the same as your peers! Through this course you will become part of the permaculture family. We’re here to support each other in our journeys, we are all peers in learning with nature the ever present teaching and inspiration. The course certificate will be awarded on the completion and mentored review of a draft Permaculture design for a location of the student's choosing. In response to feedback, a bonus day has been added to this course. This day will be dedicated to this review process through discussions with teachers and peers. The 'presentation day' is scheduled about one month after the PDC to enable the digestion and application of the class and practical material in a methodical manner to a specific design space. Where students are unable to complete their draft in time for the review or are unable to attend (in person or electronically), an alternate meeting should be arranged within 6 months of the course's final class session to obtain certification. The days will be defined closer to the time, however either a Monday to Friday arrangement OR a Mon-Thurs, Sat-Mon, Wed-Fri type arrangement will be defined depending on the availability of sites for visiting. Attendees are welcome to express a preference, however where necessary the decision will be taken with a preference for providing the best learning experience for attendees. Course hours will typically be 9:30 - 5:30 including 1 hour of combined breaks. However there may be after hours and in between days activities which are optional, but likely highly beneficial. The Recap day will be arranged for a weekend and a discussion will be held during the course to try to accommodate as many of the groups availabilities as possible. This day also serves to reinforce the commitment Terra Perma has for supporting its students beyond the completion of the class content. The course will run from at various locations in Pemberton with tours to locations farther a-field. Closer to the time the details of accommodation, food and other logistics options will be provided to assist with budget and comfort requirements. Field trips will be included in the course timetable and transport will be arranged. Whilst they have not yet been confirmed, we're very excited about the opportunities available and its going to be tricky to narrow them down to fit within the education framework - hence the potential for "after hours / day off" activities. There is so much to see and talk about. More information to come on this. Charles and Jolene will be the core team with Charles specialising in teaching team and Jolene split between teaching and the logistics / food. Guest teachers will be present for appropriate topics to ensure as many personal experiences / teaching methods are presented throughout the course as possible. We are planning to increase our guest presenter contributions and will be inviting back some PDC graduates to gain experience presenting PDC topics or discussing their own experiences. We'll share a delicious range of home made gluten free and vegetarian options for morning and afternoon teas, accompanied by tea and coffee facilities (yes we like proper coffee too!). For other dietary requirements please contact us prior to booking in. The food is always a highlight... unless you're dieting :). Lunch is BYO, however there are shops/eateries just minutes away with a great range of healthy and exciting food options. Basic cooking/kitchen facilities will be available for heating, serving and washing depending on locations, but we'll discuss this closer to the time. and, best of all, immersion in the WA permaculture scene for future reference/support. There is a reason WA permie groups are full of Terra Perma grads, we grow empowered 'be the change' people. The length and immersion of the topics (trial by ordeal) brings our PDC groups very close together creating the most important and significant 'benefit' of a doing a PDC. You get peers at the same point in life, and become part of Terra Perma's extended family with its life long Permie support service. Yes, after this course you will be part of the family and we are here to support each other in our journeys. Having a group of approachable, knowledgeable friends attempting the same life changes is actually the most important thing to come out of your PDC experience, and something online courses can't offer. Peer support is very important when so many around us are not interested in being a change agent. Why do a PDC with Terra Perma ? Terra Perma have had 6 years and ten PDC's to refine our course from regurgitating permaculture curriculum, to actually working permaculture thinking into what people need to know about nature and want to know about living in Perth and rural WA. We are making ecological common sense common again. We teach everyone to design with Permaculture's toolkit, how much detail you learn on top of that will depend on where you are starting from. With new ways of thinking and patterning like nature you will look at any situation and start designing a better one, it will be your new default setting. Apologies in advance :). 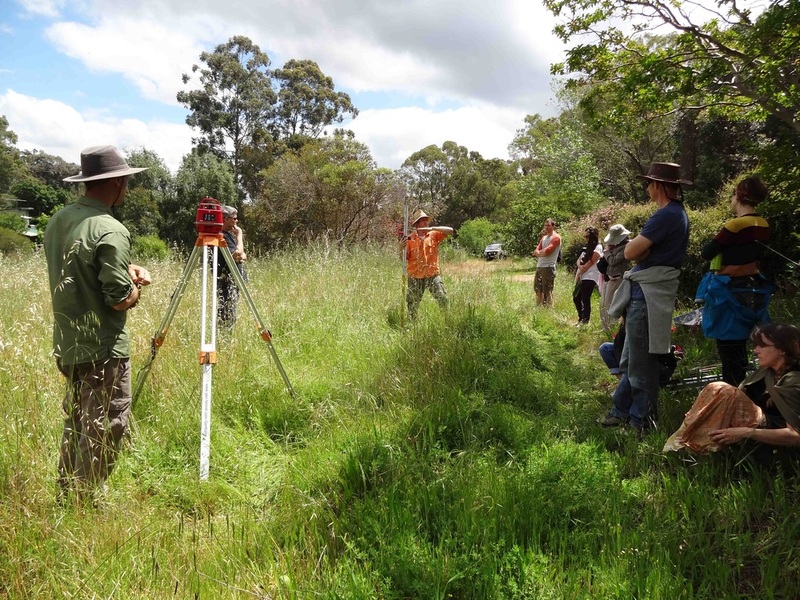 You will leave this course with new eyes, brains and opportunities - just have a look around the WA Permaculture community and see what all the amazing Terra Perma grads are doing! As most things are learned by doing, you can have access to all the combined wisdom, ingenuity and ideas of Charles, Jolene and others who have learned from both the failure and success of doing. We try everything that's worth trying and find out what works and what does not! This is not something that can be read in books and, while you will need to learn this all yourself, hearing our experiences will save you a lot of time. Many poster-child Permaculture techniques are not suitable for the WA climate/soil, so if one simply copies from the Eastern States and overseas Permaculture books, then failure and disappointment is highly likely. Over the duration of the course you will learn how to design and adapt these techniques to our unique set of conditions, so you can avoid blindly copying situation specific ideas and fads (e.g. herb spirals, swales, corrugated iron raised beds, elevated hugelkultur, aquaponics, vertical gardens, etc). As you will learn, in the right situation these are all great techniques, however most are prone to failure in Perth's conditions if not intelligently and situationally adapted. So you can be assured that we offer a localised, accredited, and design- based PDC. Land development groups, community gardens, community associations, local councils and private businesses choose us as their ecological, sustainable educator due to our reliability and return on investment. Permaculture design and ecological thinking is universal and global in its application. With us, not only will you specialise in urban and rural design in WA, but gain the ecological know how and design processes to apply it anywhere in the world, at any point in your life, and on any scale. That is the true beauty of Permaculture. What you will learn on a Terra Perma PDC. Nature is the teacher, we are just opening your eyes and justifying the time you will need to allow for this new learning journey. Permaculture ethics (our common ground) and principles (rule of thumb). Solid and universally applicable Permaculture design process. Systems thinking - Allowing the inter-connectedness of design elements. Pattern Understanding - Nature has a tried and tested the design blue print of most situations, working the human potential into these already effective solutions allows permaculture to be bountiful and accelerated. Understanding the impacts of climate and landscape. All about plants - fun, food, fodder, fuel, "Farmaceuticals", fertliser and basic botany. More importantly you learn how to ask experts the right questions to get what you need for your specific situation. 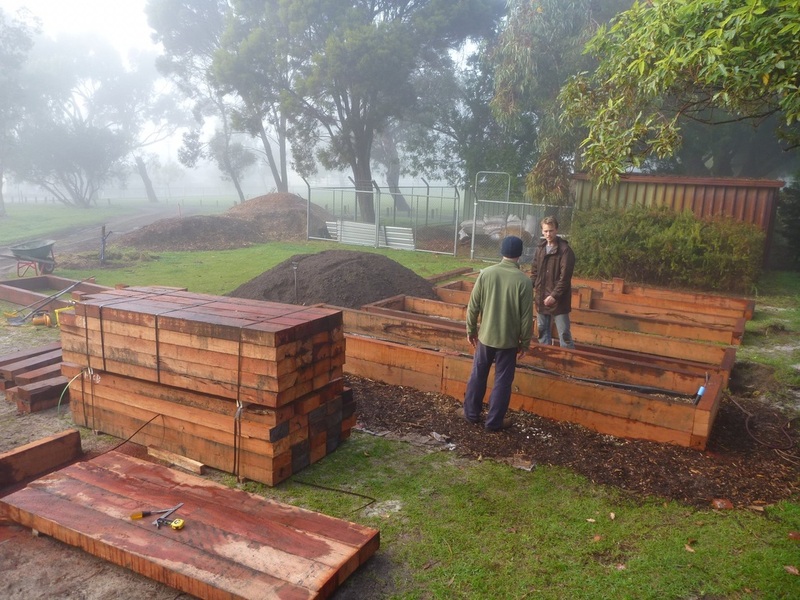 Permaculture Designers are initially a jack of all trades, ecological project manager. Orchard and food forest design. Intro to tree based ag, coppice and other tree farm systems. Understand nature's recycling: Cycling wastes/nutrients, cycling water, & cycling energy. Soil health: Creating a balanced, long term water-holding, mineral-rich, nutrient-storing and life-filled soil. The first step in any self-sustaining landscape. Designing water into urban/peri-urban landscapes. How to carry out water audits and then design a integrated water supply to meet your needs. Water harvesting and drought-proofing in the home and in the land. Design water-wise urban/peri-urban landscapes: use water where it falls. Rural Farm Design via Darren Doherty's Regrarians Platform. Solar passive home design, with natural materials, techniques, including existing home modifications. Retrofitting and appropriate Technology and new ideas - Rocket stoves, solar ovens, earth tube air conditioners, containerised gardening. Learn what are appropriate Buildings and Structures. Plus explore easy to build garden and farm structures, and simple engineering. Learn + practice Permaculture designing, drafting & report writing. Tree-centric design thinking - ecological design. Food production - Intensive annual plants, perennial plants and animal systems. 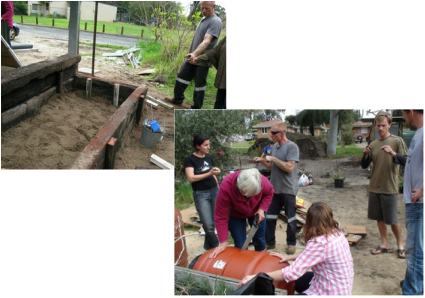 Small urban livestock animal systems - chooks, worms, rabbits, etc as well as encouraging native helpers. Seed saving, propagation, plant grafting and plant breeding. How to become a Change Agent - Learn the Power of “Just Doing Stuff”. Integrating all this with System planning. Appropriate technologies for future communities. How to participate in and create resilient communities. Local networks, communities and tips and tricks for low impact living. Here is the Table of Contents example of the ever-evolving Design book we have made for you. And an example chapter so you can see the detail. Plus Jolene has been busily writing a blog about an example PDC to walk you through the topics day by day (ongoing) - go have a read. This blog will be starting again soon. These topics are a blend of the traditional PDC topics, but with a new 2019 agenda, a WA based rationalisation and an attendees' needs-based assessment dictating the time and detail spent on each topic. Much has changed since Mollison and Holmgren wrote the required Permaculture Design Certificate topic list and Design Manual. The whole world needs saving now - the transition movement has come a long way, legal financial changes have occurred, global food security demands have resulted in land and water grabbing, holistic farming and regenerative agriculture is on the rise, and there is an increasing and unavoidable urbanisation. No prior experience is necessary to do the PDC, but it can help to have started some background reading and found an excuse to get your hands in the soil. Simple information sheets have been provided to introduce some of the design ideas. Please browse our resources and workshop notes here, and items are available from our TP library which are available for loan to make sure that the content suits your needs. We advise against buying books at this point. Once you have our 300+ page manual, you won't need to buy many of the 'permaculture' books as the foundation information is all very similar. Save your money for special interest texts and reference books later. We like to tailor the course towards the group's needs to assist all to achieve their goals. So consider this and make sure you let us know why you're looking to do the PDC, any past experiences & your future goals when you sign up. Please use your Last Name plus "SPR19PDC" within the narration box. - "Best thing you can do to get a thorough understanding of using nature's methods to grow edible food in a complete sustainable system - and have a heap of fun! You'll leave full of enthusiasm & growing confidence....and probably a few kgs heavier!" - "I feel everyone needs to learn this information - either if your just a gardener, farmer, eco-conscious, someone buying or building a house, or just wanting a more sustainable way of living. The information is enriching & simple enough to understand and convey into your own current and future practices." - "... I have especially enjoyed the group dynamic and networking. I feel like part of the Permie family ..."
- "This course was an inspiring experience providing a great deal of local knowledge and hands on practice. It was delivered professionally in a friendly environment and the group dynamics made for a special event." - "Best course I ever went to and spent money on! My normal life went on standby for two weeks, but I'm feeling I have started on a journey towards my new life." - "Their passion for the subject is contagious." - "Attending a PDC helps us understand nature's immense complexity and redirects our role as human beings within it. You all brought a casual yet informative learning experience which made me feel comfortable and happy to learn." - "As I had only a little knowledge of Permaculture, all the sections were very valuable to me. As a result of doing the course I feel more confident about approaching my own projects and using my own designs. I felt comfortable in the studying environment with the small group and excellent teaching team." - "The PDC course was a wonderful experience as it has changed my views about so many things related to gardening. I am glad I am taking some knowledge out of this course as opposed to information." - "The very easy going, approachable nature of Charles, Jolene, Damien and Shaun along with their immense knowledge make the overall experience incredibly enjoyable, educational and motivating. Thanks." - "It is inspiring to know that there are solutions that will regenerate this world and that we can all make a difference if we take the steps. The PDC is a real wake-up call to get-off the crazy hamster wheel of what is the norm nowadays, to live a better, more authentic life. An excellent eye-opener. A must do for anyone who is looking to lead a more meaningful life." - "An intelligently presented, well structured course that provides a great introduction to Permaculture." - "Knowing how to save the world one back yard at a time, empowers me with a feeling of joy. I can make a difference."